It's easy to enumerate more than 10 interesting facts about Saturn, the sixth planet in the solar system. The outermost planet visible without a telescope, it was named "Lubadsagush" -- the oldest of the old -- by the Assyrians, partly because of its slow movement against the backdrop of the stars. The Greeks continued this tradition by naming it "Chronos" after the god of time, but the Roman name "Saturn" honors the god of agriculture. If there were a planet with an ocean large enough to accommodate it, you would think Saturn would float, because its density is only 75 percent that of water. However, if there were such a planet, Saturn's solid core would probably sink while the rest of its atmosphere floated or drifted away. Saturn's core has about 10 times the mass of the Earth, and it's probably rocky. Pressures are so strong at the interface between the core and the atmosphere that hydrogen condenses into a liquid, which is called metallic hydrogen because it conducts electricity. Underneath the metallic hydrogen there's probably a layer of liquid helium. The gases that compose Saturn -- predominantly hydrogen and helium -- rotate so quickly around the core that the planet appears oblong from space. It spins once on its axis is less than half an Earth day, despite having an equatorial diameter about 9.5 times larger than Earth's. Saturn radiates two to three times as much energy as it receives from the sun. The bulk of this energy comes from friction generated by helium rain. Helium condenses in the cooler upper layers of the atmosphere and gravity pulls it toward the core. It generates heat by rubbing agains hydrogen molecules as it falls. The heat generated by falling helium drives ferocious winds on the planet's surface. They can blow at speeds up to 1,800 kilometers per hour (1,118 miles per hour), which are almost the fastest winds in the solar system -- only Neptune's are faster. A planet with such strong winds is bound to have storms, and Saturn has many, although the upper cloud layer obscures most of them. Winds similar to the jet streams on Earth produce a pattern at the north pole that is almost a perfect hexagon. Saturn isn't the only planet with rings -- all the Jovian planets have them -- but Saturn's are especially impressive. They are less than a kilometer (3,200 feet) thick, but they span a distance of 282,000 kilometers (175,000 miles), which is three quarters of the distance from the Earth to the moon. Charged particles from Saturn's rings rain charged water droplets into the atmosphere. They reduce electron densities in the upper atmosphere in the regions in which they fall, and this has a cooling effect on those regions. In other words, Saturn's climate is affected by the ring structures, which are 60,000 kilometers (36,000 miles) above the surface. 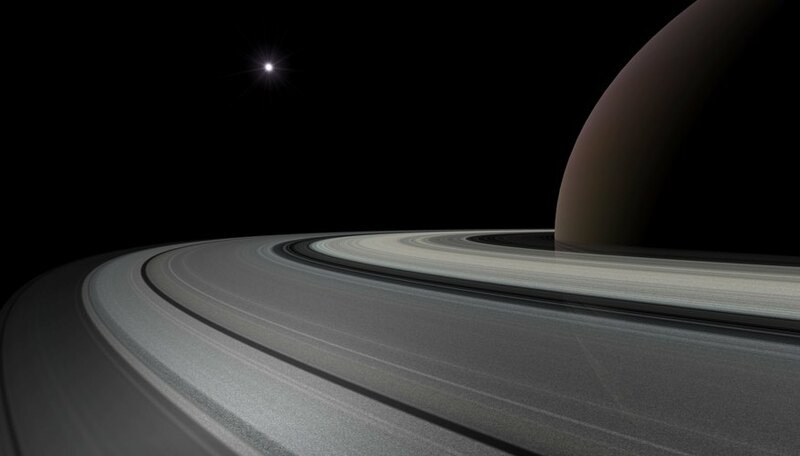 Besides its impressive ring system, Saturn has 53 named moons and nine provisional ones. Some of these moons interact with the rings, and some pass so close to each other that they exchange orbits. Saturn's largest moon, Titan, has an atmosphere similar to that of the early Earth, and the Huygens probe, which landed there on January 14, 2005, revealed a semi-solid surface. Based on data from Huygens and the Cassini orbiter, scientists believe that a salty ocean exists just below this crust. Deziel, Chris. "10 Interesting Facts About Saturn." Sciencing, https://sciencing.com/10-interesting-saturn-7196137.html. 24 April 2017.